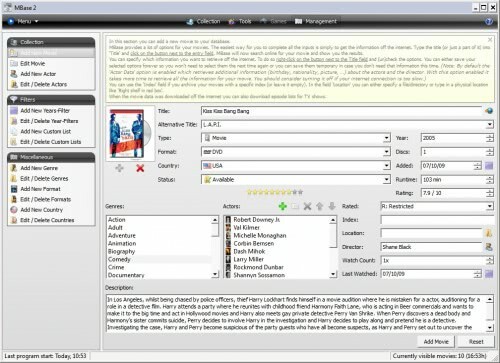 Probably the best way of managing and maintaining a movie collection is to make use of a movie database software. We have covered several software programs in the past like the video collection software Movienizer, Eric's Movie Database or the movie collection manager Griffith. Today's movie database software is MBase 2, a portable software program that is available with an English and German interface. MBase 2 makes it dead easy to add and manage movies. The only input that is required is the name of the movie. MBase 2 will then perform an Internet search for the movie and display results. It is up to the user to pick the best result from the list. All information about a movie, including actors (including pictures), director, movie covers, genre, year or description are downloaded and added to the various fields in the software once a movie has been identified. It usually takes less than 30 seconds to add a new movie to the movie database. It is still possible to change certain information although that is usually not necessary. A quick link to Wikipedia is provided as well which can be used to add information easily or retrieve additional information and links. MBase 2 comes with a loan management module to keep track of movies that have been loaned and extensive statistics. MBase 2 is a comfortable portable movie collection software. Nice application but lacking in its lookup capabilities. Especially with many US films, where it frequently seems to be unable to the locate cover art and plot summary. Very good at gathering up actor information however. Interface is somewhat non-standard for a Windows app. Interesting to note there’s no QUIT choice to exit the app from the main menu. I would like software that manages movies on my HD. Like iTunes for all my divix movies. wow martin, what a find! i’ve tried every app like this that i’ve come across, and this one definitely suits me best. thanks for the great post. All My Movies is also one of the best software for movie collectors.